Sponsored by Trinity College at the University of Melbourne and supporters, this prize, now in its fifth year, recognises the talent of young Indigenous writers across Australia. In 2019, the prize will be awarded to the best short story by an Indigenous writer who is 30 years or younger at the closing date of the competition. First place is a $5000 prize, publication in Overland’s print magazine, and a writing residency (of up to three months) at Trinity College, the oldest student residence at the University of Melbourne. Two runner-up prizes of $500 may also be awarded. The residency includes accommodation in a small flat near the campus and all meals (breakfast, lunch and dinner) can be eaten in Trinity’s dining hall. The flat is suitable for a single person or couple (children may be able to be accommodated, also). There will be opportunities to engage in campus and college life, to give workshops or talks, and the potential to receive writing mentorship (per negotiation with Trinity College and Overland). Trinity College is the oldest residential college at the University of Melbourne. It is home to over 300 residential students, including a number of Indigenous students. Trinity’s Indigenous programs have been developing since Sana Nakata and Lilly Brophy became the first Indigenous students to attend the College. Note: There will be an award ceremony at Trinity College in Melbourne in April. Travel and one-night accommodation will be awarded to all three prizewinners to attend the ceremony. Read the previous winners: Jessica Hart (poetry); Marika Duczynski (fiction); Ellen van Neerven (poetry); Evelyn Araluen (fiction); Raelee Lancaster (poetry). 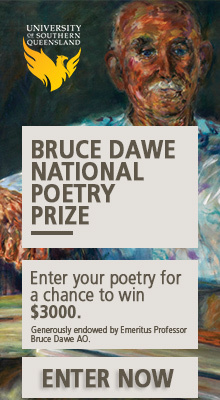 The prize is open to Indigenous writers who are 30 years or younger at the closing date of the competition. In 2019, the prize will be awarded to the best short story (up to 3000 words in length). The work must be unpublished at the time of entry. The position of Writer-in-Residence at Trinity College is not compulsory and more details will be provided upon presentation of the prize. Submission of work will be processed electronically and judged anonymously. The author’s name must not appear on the submitted document. The prize will be awarded at the judges’ discretion and they reserve the right to not select a winner. Second and third place prizes may be awarded at the judges’ discretion. Please follow this link to enter the prize.